A safe mine site starts and ends with its culture. Tyre management operations at mines make up a critical part of this ethos. 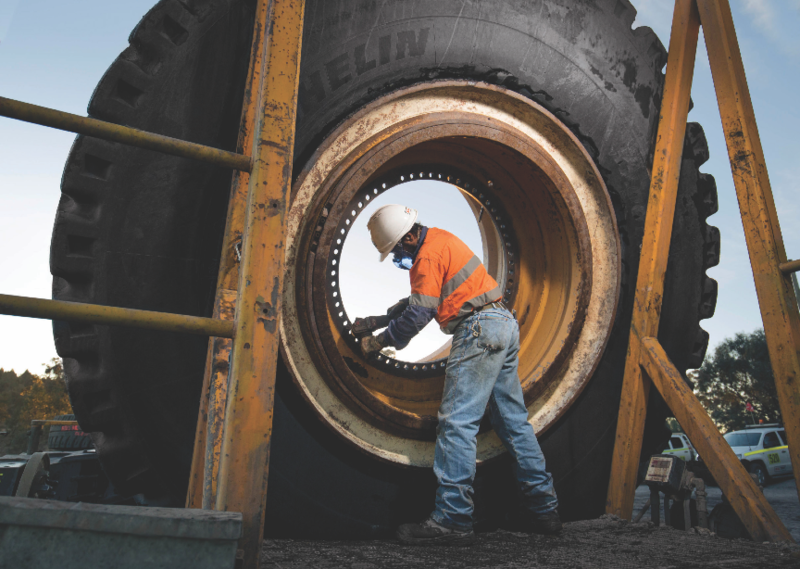 From the energy that is stored within a haul truck’s tyres to their sheer weight, tyre management teams need to be aware of the risks that come with their daily activities. Kal Tire takes a leadership role with the mining companies it provides tyre management and services to as part of a relentless commitment to safety. 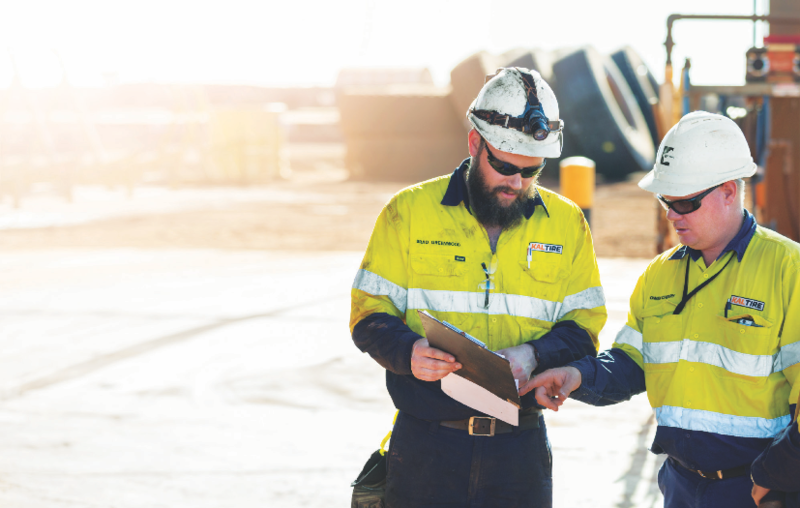 The Canadian company has introduced a consistent focus on maintaining high safety standards across its global operations, including at the group’s sites around North America to its operations in Australia. No risk is overlooked at Kal Tire. The company follows a thorough training and awareness regime that helps its teams stay on top of these risks on a daily basis. Kal Tire Australia managing director Darren Wilson says the key objective is to help mining companies control and mitigate the risks associated with the operation and management of their tyres and wheels. “In order to do this our team need to be armed with the right knowledge, processes and procedures,” Wilson says. Brad Greenwood and Owen Cherry discuss Kal Tire’s upcoming activities. Kal Tire uses an internally-developed learning management system (LMS) to provide training and skills knowledge to its workers. Wilson says the LMS provides Kal Tire with an efficient way to deliver a constant safety message across its operations. “Our internal service technical and training group also provides support to our front line team by offering specialised safety training and on the job advice to help them ensure that we continually improve our practices and processes,” Wilson says. Kal Tire’s approach to managing the risks also allows it to demonstrate a focus on innovation to deliver improvements. The company’s Gravity Assist System, a mechanical tool developed to safely and weightlessly manoeuvre 36-kilogram torque guns used to fasten lug nuts on earthmover tyres, is a leading example of this innovation. Gravity Assist mitigates some of the burden handlers face when dealing with the immense weight of tyres and wheel components. Here, Safe to Work looks at the Kal Tire approach to safety and the key risks faced by the company at mining operations. Controlling and mitigating the individual risks of tyre management always circles back to the safety culture of the team and the leadership that drives it. Kal Tire focuses on the development of its leaders and front line workers to instil this culture, according to Kal Tire area manager eastern region Brendan Schneider. “There is a big focus on not just following a set of rules but understanding what the rules are and where they have come from,” Schneider says. Kal Tire maintains its strong safety performance and standards through a series of internal checks that the tyre management teams regularly undertake. Wilson says this includes frequent safety audits and communication, operational audits and a process called the ‘6 Observables’. “The management and supervisor team engage with team members doing tasks on the floor and talk to them about the top six risk areas and what thought process they are undertaking as they perform the assign tasks,” Wilson says. The risks cover a number of areas that Kal Tire’s teams manage every day, including machine isolation, safe operation of equipment, correct use of jacks and stands, line of fire and correct use of PPE. Stands are a must to secure the massive weight that tyres carry. The air pressure in ultra-class earthmoving tyres at mine sites can reach as high as 110 psi. With this amount of pressure, comes an incredible level of energy that needs to be controlled. Kal Tire puts each tyre and all wheel components through an extensive inspection process to ensure they have the integrity to contain this level of air pressure, Kal Tire operations support specialist Ian Campbell explains. “We need a good inspection regime to make sure we pick up on any tyres that have been damaged and could, at worst, potentially burst,” Campbell says. Kal Tire has developed an ‘inflation station’ to protect tyre technicians from the force of energy that earthmover tyres hold. The ‘inflation station’ establishes a barricade of at least six metres between the wheel and technician to mitigate the risk of injury to personnel in the event of a burst or rapid release of air. Kal Tire has equipped the ‘inflation station’ with the tools and devices the handler requires for this activity, such as pressure gauges. “We park the tyre handler in front of the tyre and then usually inflate the tyre from zero to 10 psi, stop inflation, then inspect the tyre wheel assembly and make sure the lock ring and bands are installed and correctly seated,” Schneider explains. The weight of tyres and the tools used on them can potentially cause a number of injuries to mine workers and tyre handlers. Tyres and wheel components carry such a heavy weight that they put workers in danger in multiple ways. A tyre service person must be aware of the long-term muscle injuries that can stem from the manual handling of these weights, with backs especially at risk. The components also contain a number of sharp objects and pinch points that put hands, in particular, in danger of being injured. Kal Tire focuses on these risks in its training regime, which includes regular reminders of how workers should properly handle tyres or the location of pinch points. Brad Greenwood with the Gravity Assist System. “There are a lot of risks associated with the multi-piece rims and pinch points as we are working with big parts and torque multipliers,” Campbell says. These tools increase the weight of the activity significantly, which is where the Gravity Assist System comes into play. Gravity Assist acts like a mechanical arm to hold and swivel the torque gun like a weightless extension of the technician’s body, removing the need to fasten almost 70 lug nuts holding an enormous torque gun. 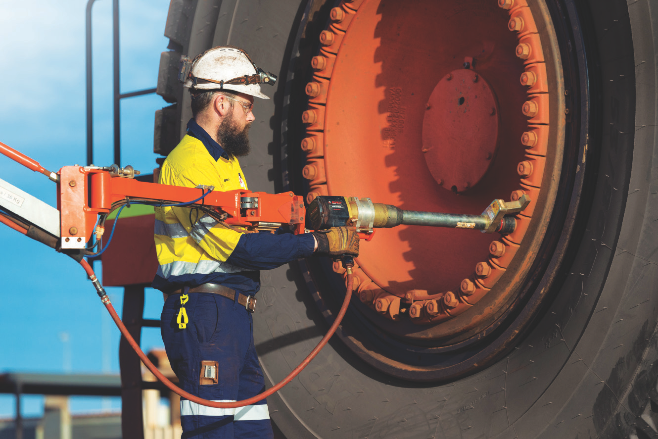 Despite the number of lug nuts contained in an average mining tyre, the Gravity Assist System renders a torque gun ‘weightless’, making the process much safer, more efficient and precise. The principles of surface and underground operations have their notable differences, something that extends to tyre management. Underground mines, in particular, pose unique risks that tyre management teams consider, especially in the event of a break down at the face of operations. While scheduled maintenance is commonly scheduled to take place on the surface at underground sites, break downs don’t afford this luxury to the teams. “While there are some similarities to what tyre servicepersons do in a wide open area, the reality is that our underground teams aren’t able create a workspace like that,” Kal Tire general manager Miles Rigney says. The safety risks primarily stem from the tyre management team having to complete tasks in situ with the location of the machine. Underground activities can then be affected by a series of environmental factors that require specific preparation, including the gradient, lighting or noise. Rigney says Kal Tire tailors its training, awareness, tooling and safe work programs to reflect the characteristics of each underground operation. The Gravity Assist System makes a task previously demanding on the body much safer. “We do job hazard analysis (JHA) to look for any deviation that may exist between the conditions described in the safe work procedure and the actual conditions, be it a gradient, noise or lighting,” Rigney says. 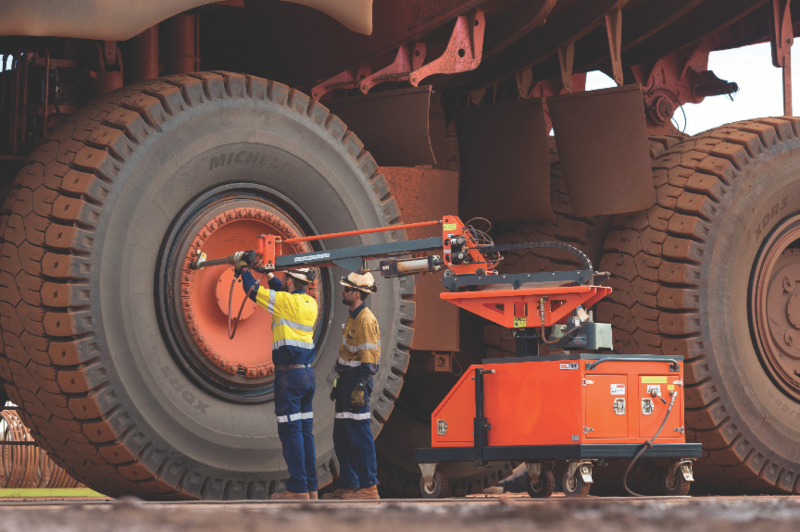 With so much focus on earthmover tyres, it can be easy to overlook the risks involved with light vehicle or ancillary tyres on mine sites, warns Rigney. Earthmover tyres are one of the most expensive costs for companies, falling behind labour and fuel as the biggest at an operation. They also drive a large portion of the productivity at an operation for their role in hauling ore around sites. Smaller tyres, however, share many of the same safety risks as their larger counterparts, albeit at their own scale. Rigney reinforces that light vehicle and ancillary tyres should be recognised by management teams in a similar way as they also contain high air pressures that are potentially dangerous. “We work with the relevant mine to make sure that there is clear definition around how those ancillary and light vehicle tyres are being managed,” Rigney says. The check involves site personnel monitoring the condition of every tyre, including components such as wheel fasteners, and assessing the potential for future issues. Selecting suitable tyres for each mining activity works hand-in-hand with ensuring a high level of productivity and safety at sites. Kal Tire continues to strengthen its service for monitoring and analysing the performance of mining tyres in operation to drive accurate tyre selection. The company generates data on the performance of tyres in different mining conditions to provide a guide for this process. “It’s important that we are involved with making sure mining companies have the right tyre for the application, and that the tyre is working within its capabilities,” Campbell says. These studies allow Kal Tire to analyse what causes tyre failures, whether it is because of incorrect tyre selection or how the operator is driving the machine. Kal Tire is introducing its tyre operations management system (TOMS) across the company’s global operations to deliver a new standard in performance. While these studies and systems drive productivity and efficiency, they also support the mitigation of the safety risks drivers face when operating machines.